HTC are a company that have given the mobile device world a number of firsts, LTE, 3D screens, front-facing stereo speakers, Duo camera to name but a few. HTC will once again be a ‘first’ on releasing the first 64-bit Android phone — nearly a year after Apple released the world’s first 64-bit smartphone. 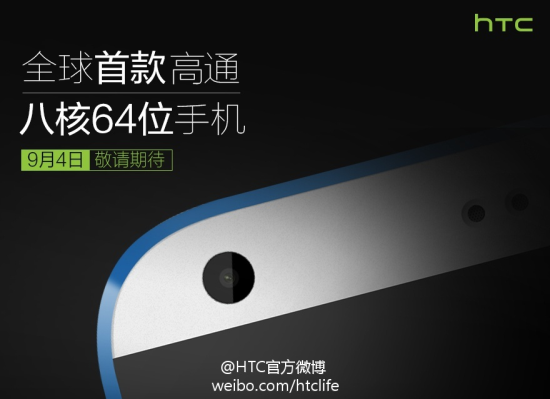 HTC today confirmed that it is all set to release the first 64-bit Android handset — the Desire 820 on September 4th through its Weibo account via a teaser image. Earlier this month, pictures of the handset were leaked onto the internet, but the accompanying rumours stated the device was likely to have a Snapdragon 410 processor. However, the teaser image in Chinese says that this phone from HTC would be the first 64-bit octa-core Android device, which points at the presence of a Snapdragon 615.